Terramia is small Italian Restaurant on the busy corner of Salem St and Bartlett Place in Boston’s North End, just down the street from Antico Forno (both owned by Carla Agrippino). It has a small but amazing menu – offering modern twists on Italian classics that are constantly changing to incorporate seasonal produce. I ordered the Raviolone Aperto (pictured above). As you can see the open ravioli were not gluten free, but they were able to substitute with their gluten free linguine which was amazzzzing. 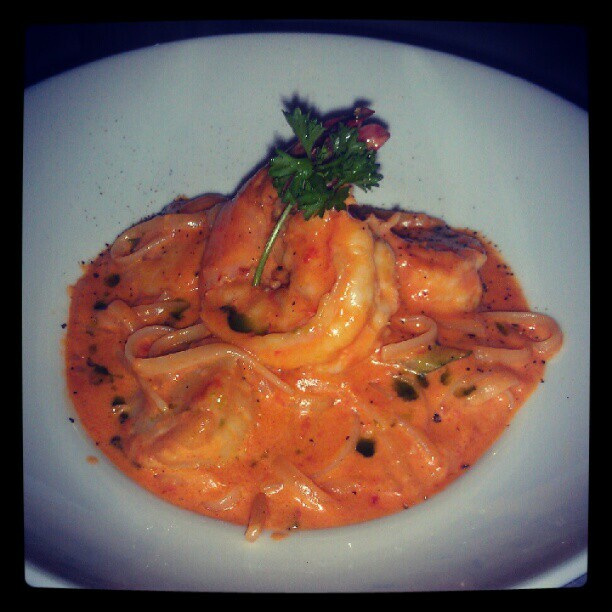 It was loaded with big shrimp and scallops in a creamy lobster mascarpone sauce. A little bit expensive, but certainly worth it. Our waiter was knowledgeable about gluten allergies, and actually apologized that they only had one type of gluten free pasta that night, and siad normally there is a choice between ziti and linguine. 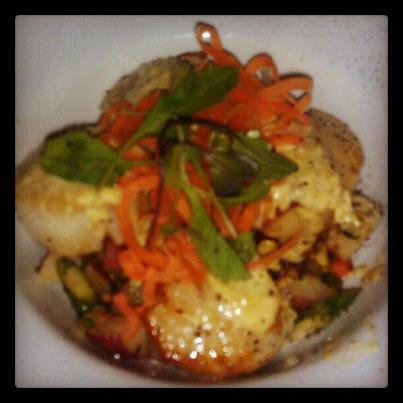 My mom ordered the Capesante Affumicate con Ciliege (smoked scallops – pictured below) which was delicious as well. It was filling enough to be an entree, but was actually listed under the Antipasti e Insalate section (antipast0 and salad). Capesante Affumicate con Ciliege: Pan seared day boat sea scallops with a “potato leek risotto” roast corn, asparagus tips & pancetta caponata, cherry-wood essence, Meyer lemon beurre blanc. Looking for other gluten free restaurants in Boston’s North End? Try Benevento’s, Nebo and Lucca. Last night I went to the well known Lucca, situated in Boston’s historic North End on Hanover Street. Lucca offers Northern Italian Classics as well as creative modern dishes. Their menu lists gluten free ziti as a substitute for any of their pasta dishes, but they can also alter other entrees to be gluten free as well. Our server was well informed, and the kitchen was knowledgeable about how to accommodate for a gluten allergy. I dined out with my Dad and little sister in front of their large open windows on a sunny bustling Monday in the city. My food was delicious, and my family was delighted with their meals as well. 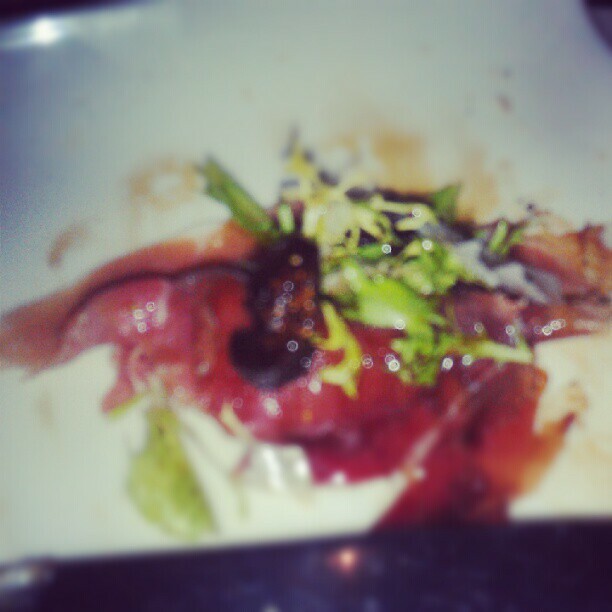 My meal pictured below – as you can see, I was so excited to eat it I forgot to take a photo first! Benevento’s is a cozy North End restaurant with a full menu of veal, chicken, seafood, pasta, salad, and brick oven pizzas. Most importantly, the brick oven pizzas can be made gluten free! They will prepare your pizza on a disposable pizza tin that can go straight into the brick pizza oven. So far I have had the regular Cheese Pizza and the North Ender (Prosciutto, sopressatta, garlic, oregano, extra virgin olive oil, basil, mozzarella cheese). As far as gluten free pizza goes, they were both delicious! They are medium sized, enough for 2 people to share. Thin crust that is not too gooey or grainy. Will update with more reviews the more I try! So I just moved to the North End in Boston… AMAZING place to be for an Italian girl…Not so amazing for a Celiac. Bakeries and pasta left and right, but it’s not all bad news. The North End has a few places that can accommodate a gluten free diet: Benevento’s, Terramia, Lucca and Nebo are my new favorites. And Marco, Mother Anna’s, La Familia Giorgios, and Pomodoro also tout gluten free options, and are next on my list to try out. Allergy Eats.com is a great new website helping people with food allergies find places they can eat. A google search can often overlook a lot of restaurants that do not key word their website/menu as having gluten-friendly options. Because of this, you may miss out on some awesome accommodating restaurants. 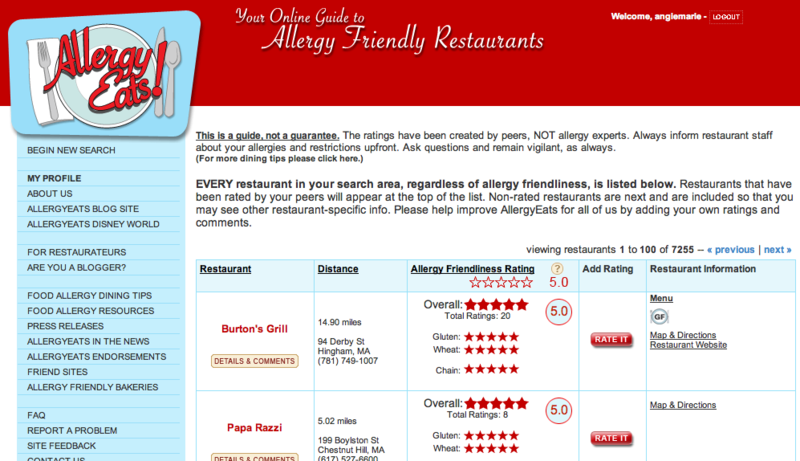 Allergyeats.com lets you search via allergen(s) and location to find restaurants in your area. The website relies on user ratings and comments to suggest accommodating options. So, the more we start rating, the more reliable and helpful this site will be! So log on, and find something new and safe in your area. And while you’re there, sign up (free) and start reviewing your favorite places! Glutenus Minimus is a fabulous bakery in Belmont that serves gourmet gluten free goodies. The bakery was started by Natalie McEachern, an italian girl who was diagnosed with Celiac during college as well! Her baked goods taste just like the real thing, and are available not only at her bakery in Belmont, but in various stores around Greater Boston. Her cupcakes are sold in two packs in the SWEET bakeries, and I have had her cookies and brownies from Stone Hearth Pizza in Cambridge. All Delicious! Check her out here, and look for a vendor near you. Oh P.F. Chang’s, how I love you! I live about 6 minutes from a P.F. Cang’s, six minutes on foot. Needless to say, I am there quite often. P.F. Chang’s Chinese restaurant, is committed to providing an exceptional dining experience- Each dish is prepared to order using the freshest & highest quality ingredients. P.F. 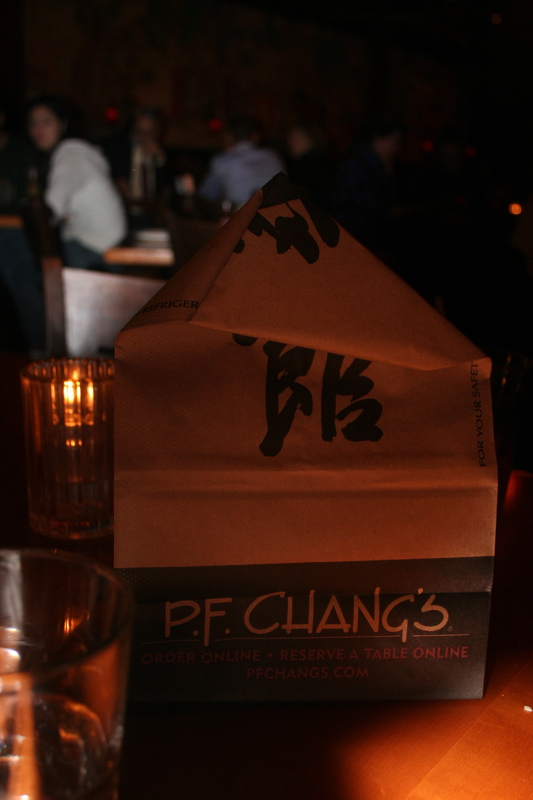 Chang’s offers a very large gluten free menu, that is proudly presented in the side tri fold of every single menu. That’s right, you don’t even have to ask for a separate menu. Their servers are very knowledgeable about the menu, and about the importance of allergies. You must inform your server of your allergy, and he will remove the soy sauce that comes standard on every table, and will bring you your own gluten free soy sauce. You can check out there menu here! And here are pictures of my most recent trip to P.F. Chang’s! Papa Razzi is a modern Italian trattoria, featureing made-to-order signature pasta dishes, ultra thin-crust pizzas, seafood specials and desserts. For celiacs, Papa Razzi offers gluten free ziti as a substitute in any of their regular pasta dishes, gluten free versions of their pizzas, and gluten free bread to begin your meal. Along with their gluten free specialties, all entrees are made to order and can be altered to meet your gluten free needs. 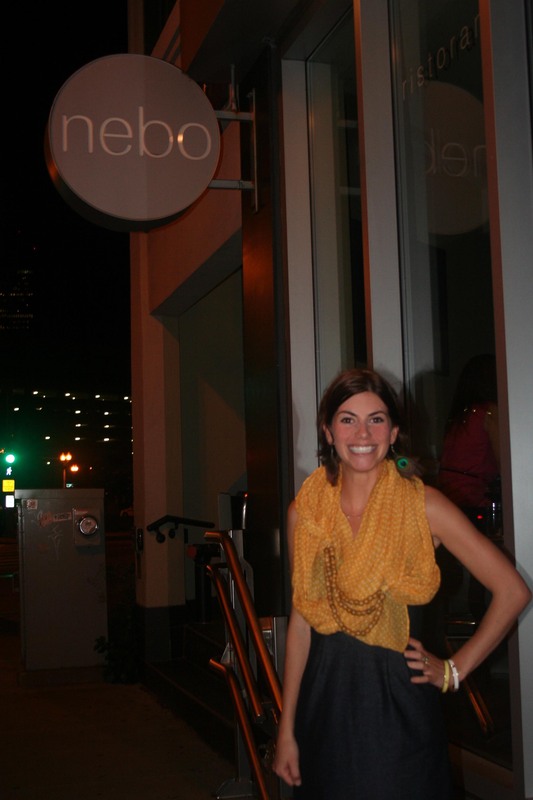 Nebo is my #1 pick for gluten free Italian food in Boston. 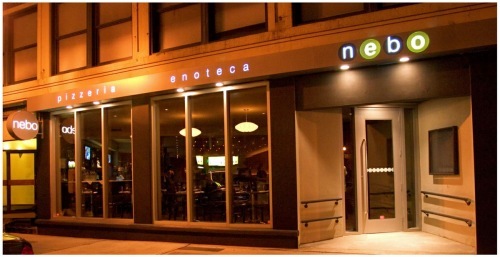 Opened in June of 2005, nebo is an upscale Italian restaurant and enoteca (wine bar) located in the heart of Boston’s North End. Born in Boston’s culturally rich North End neighborhood, chef/owners Carla and Christine Pallotta stand inspired by their mother’s and grandmother’s classic Italian recipes as well as their travels throughout Italy and other European regions. Most importantly, they offer an extensive gluten free menu that is almost identical to their regular menu. (not on the menu, but ask for it!) A flourless chocolate cake with walnuts and pistachios, topped off with ice cream. This is a list of the restaurants that I have eaten at myself, and I know are trustworthy. I am sure there are other trust worthy restaurants out there as well, but I only want to list the ones I can vouch for myself… I will keep adding as I keep eating! Want to add to this list? Leave a comment below and include a review of your favorite gluten free spots!